The Kaikoura Peninsula features a dramatic rocky landscape which fringes the waters of the Pacific Ocean in Canterbury, New Zealand. A beautiful time to visit this area of the peninsula is at sunset. Like a platform leading towards the deep waters of the Pacific Ocean, the rocky landscape of the Kaikoura Peninsula coastline shows evidence of uplifting as a result of plate tectonics. Exposed limestone rock formations as a result of uplifting have been eroded and the remaining rock then shaped by the forces of the ocean and weather. The formations of this unique rocky platform provide a dramatic foreground during sunset photography. The rocky landscape and outcrops at this section of the peninsula provides a haul out for a colony of New Zealand Fur Seals who bask in the sun during the day and hunt for prey in the ocean at night. 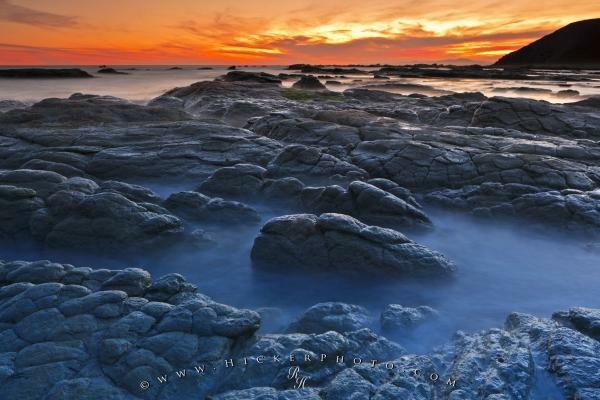 Photo of sunset over the Pacific Ocean and surreal coastal landscape of the Kaikoura Peninsula, Canterbury, New Zealand. ... These nutrients attract a variety of marine mammals including the mighty sperm Whale, seals, dolphins, and more. 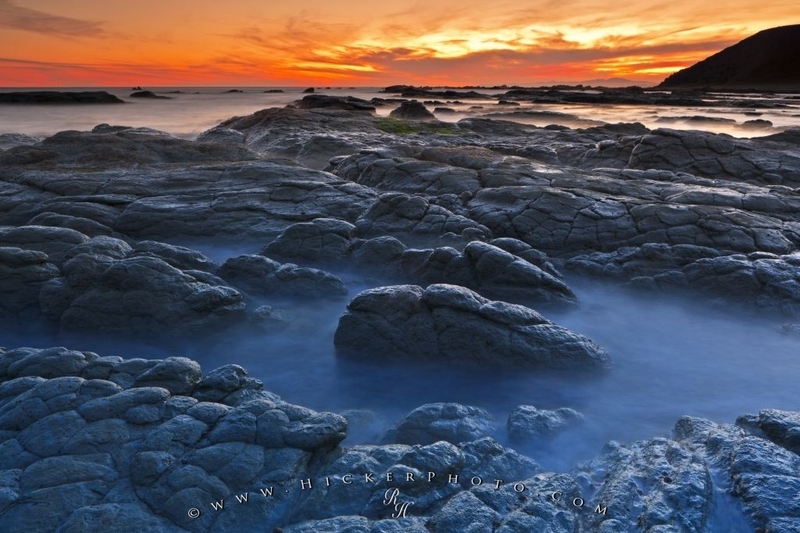 Sunset is a wonderful time to be standing along the coast looking out towards the ocean while surrounded by the diverse landscape of the Kaikoura Peninsula. Sunset on the Kaikoura Peninsula near the Seal Colony, Kaikoura, East Coast, South Island, New Zealand. I photographed this photo with the digital SLR camera model Canon EOS-1Ds Mark II, aperture of f/16.0, exposure time of 1/0.04 sec. on ISO 50, as always I used a original Canon Lens, the focus lenght for this picture was 25mm.